Meet us by the lake. 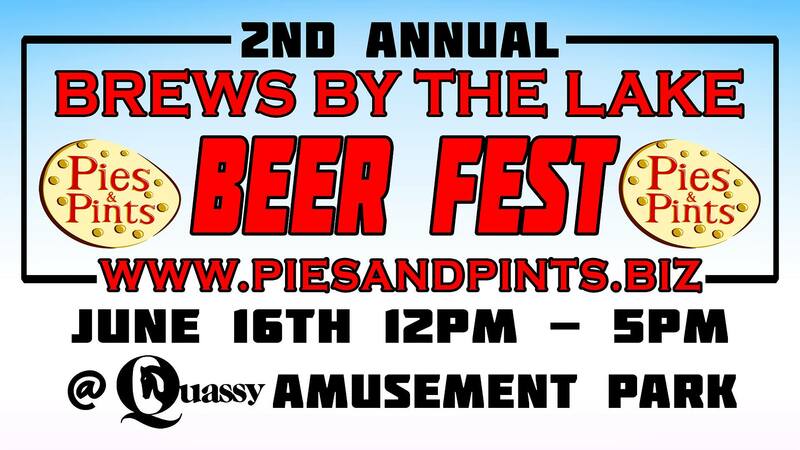 Pies and Pints Restaurant Group would like to invite you to participate in the second annual "Brews by the Lake" being held at Quassy Amusement Park. This event will take place Saturday Fathers Day Weekend, June 16, 2018 from 1:00 p.m. - 5:00 p.m. (VIP early access 12 noon) "Brews by the Lake" is a nonprofit event with all its proceeds benefiting the amazing children at our local YMCA. We would love nothing more than kick off summer right by adding as much scholarship funds to their account as possible. So please join us this Fathers Day weekend and help us make this a successful event. 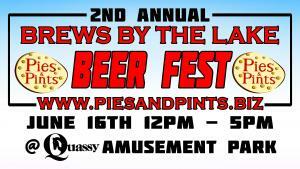 PLEASE READ: YOU MUST BE 21+ TO PURCHASE TICKETS AND ENTER THE BEER FESTIVAL. REGULAR TICKET DOES NOT INCLUDE PARKING OR RIDES. FOOD WOULD BE AVAILABLE FOR PURCHASE DURING THE EVENT.